What is Azure Logic Apps? Azure Logic Apps is a cloud service that helps you automate and orchestrate tasks, business processes, and workflows when you need to integrate apps, data, systems, and services across enterprises or organizations. Logic Apps simplifies how you design and build scalable solutions for app integration, data integration, system integration, enterprise application integration (EAI), and business-to-business (B2B) communication, whether in the cloud, on premises, or both. Process and route orders across on-premises systems and cloud services. Send email notifications with Office 365 when events happen in various systems, apps, and services. Move uploaded files from an SFTP or FTP server to Azure Storage. Monitor tweets for a specific subject, analyze the sentiment, and create alerts or tasks for items that need review. To build enterprise integration solutions with Azure Logic Apps, you can choose from a growing gallery with 200+ connectors, which include services such as Azure Service Bus, Functions, and Storage; SQL, Office 365, Dynamics, Salesforce, BizTalk, SAP, Oracle DB, file shares, and more. Connectors provide triggers, actions, or both for creating logic apps that securely access and process data in real time. How does Logic Apps work? Every logic app workflow starts with a trigger, which fires when a specific event happens, or when new available data meets specific criteria. Many triggers include basic scheduling capabilities so that you can specify how regularly your workloads run. For more custom scheduling scenarios, start your workflows with the Schedule trigger. Learn more about how to build schedule-based workflows. Each time that the trigger fires, the Logic Apps engine creates a logic app instance that runs the actions in the workflow. These actions can also include data conversions and flow controls, such as conditional statements, switch statements, loops, and branching. For example, this logic app starts with a Dynamics 365 trigger with the built-in criteria "When a record is updated". If the trigger detects an event that matches this criteria, the trigger fires and runs the workflow's actions. Here, these actions include XML transformation, data updates, decision branching, and email notifications. With businesses moving toward digitization, logic apps help you connect legacy, modern, and cutting-edge systems more easily and quickly by providing prebuilt APIs as Microsoft-managed connectors. That way, you can focus on your apps' business logic and functionality. You don't have to worry about building, hosting, scaling, managing, maintaining, and monitoring your apps. Logic Apps handles these concerns for you. Plus, you pay only for what you use based on a consumption pricing model. In many cases, you won't have to write code. But if you must write some code, you can create code snippets with Azure Functions and run that code on-demand from logic apps. Also, if your logic apps need to interact with events from Azure services, custom apps, or other solutions, you can use Azure Event Grid with your logic apps for event monitoring, routing, and publishing. Logic Apps, Functions, and Event Grid are fully managed by Microsoft Azure, which frees you from worries about building, hosting, scaling, managing, monitoring, and maintaining your solutions. With the capability to create "serverless" apps and solutions, you can just focus on the business logic. These services automatically scale to meet your needs, make integrations faster, and help you build robust cloud apps with minimal code. Plus, you pay only for what you use, based on a consumption pricing model. To learn how companies improved their agility and increased focus on their core businesses when they combined Logic Apps with other Azure services and Microsoft products, check out these customer stories. Save time and simplify complex processes with visual design tools. Build logic apps from start-to-finish by using the Logic Apps Designer through your browser in the Azure portal or in Visual Studio. Start your workflow with a trigger, and add any number of actions from the connectors gallery. Create commonly used solutions more quickly when you choose predefined workflows from the template gallery. Templates range from simple connectivity for software-as-a-service (SaaS) apps to advanced B2B solutions plus "just for fun" templates. Learn how to create logic apps from prebuilt templates. Some patterns and workflows are easy to describe but hard to implement in code. Logic apps help you seamlessly connect disparate systems across on-premises and cloud environments. For example, you can connect a cloud marketing solution to an on-premises billing system, or centralize messaging across APIs and systems with an Enterprise Service Bus. Logic apps provide a fast, reliable, and consistent way to deliver reusable and reconfigurable solutions for these scenarios. Businesses and organizations electronically communicate with each other by using industry-standard but different message protocols and formats, such as EDIFACT, AS2, and X12. With the features in the Enterprise Integration Pack (EIP), you can build logic apps that transform message formats used by your partners into formats that your organization's systems can interpret and process. Logic Apps handles these exchanges smoothly and also securely with encryption and digital signatures. For example, if you're using Microsoft BizTalk Server, logic apps can communicate with your BizTalk Server by using the BizTalk Server connector. You can then extend or perform BizTalk-like operations in your logic apps by including integration account connectors, which are available with the Enterprise Integration Pack. Going in the other direction, BizTalk Server can connect to and communicate with logic apps by using the Microsoft BizTalk Server Adapter for Logic Apps. Learn how to set up and use the BizTalk Server Adapter in your BizTalk Server. Create your logic apps as templates so that you can deploy and reconfigure your apps across multiple environments and regions. If you don't find the connector that you want or need to run custom code, you can extend logic apps by creating and calling your own code snippets on-demand through Azure Functions. Create your own APIs and custom connectors that you can call from logic apps. Logic Apps uses consumption-based pricing and metering unless you have logic apps previously created with App Service plans. Workflow: Visualize, design, build, automate, and deploy business processes as series of steps. Triggers: Many Microsoft-managed connectors provide triggers that fire when events or new data meet specified conditions. For example, an event might be getting an email or detecting changes in your Azure Storage account. Each time the trigger fires, the Logic Apps engine creates a new logic app instance that runs the workflow. Actions: Actions are all the steps that happen after the trigger. Each action usually maps to an operation that's defined by a managed connector, custom API, or custom connector. Enterprise Integration Pack: For more advanced integration scenarios, Logic Apps includes capabilities from BizTalk Server. The Enterprise Integration Pack provides connectors that help logic apps easily perform validation, transformation, and more. How does Logic Apps differ from Functions, WebJobs, and Flow? All these services help you "glue" and connect disparate systems together. Each service has their advantages and benefits, so combining their capabilities is the best way to quickly build a scalable, full-featured integration system. For more information, see Choose between Flow, Logic Apps, Functions, and WebJobs. Logic Apps is one of the many services hosted on Microsoft Azure. So before you start, you need an Azure subscription. If you don't have a subscription, sign up for a free Azure account. 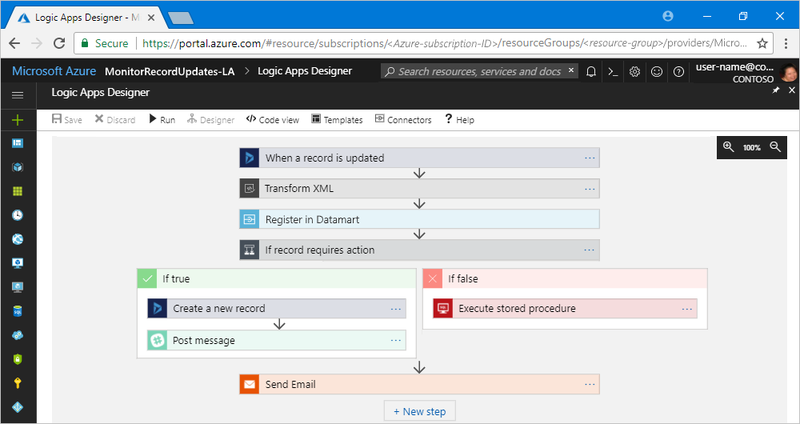 If you have an Azure subscription, try this quickstart to create your first logic app, which monitors new content on a website through an RSS feed and sends email when new content appears.